This week you’ll be able to increase your chances of hanging on to your bike — or get an inexpensive bike. And just in time to celebrate next week. On Wednesday (May 3), bicyclists can get a free location tracker added to their bikes to give authorities a better chance to recover any that are stolen. And on Saturday (May 6), the university's semiannual Bike Auction will feature more than 400 bikes for sale. In this video, a bicyclist shares how he was able to recover a stolen bicycle because of a Tile tracker. The Wednesday location tracker event, sponsored by the UC Davis Police Department, Transportation Services and the Davis Bike Club, will provide free Tile trackers to any faculty member, staff member or student who brings a bicycle to the farmers market on the Quad between 11 a.m. and 1 p.m. The trackers use Bluetooth to connect to a mobile app, which can tell a user his or her bike’s last known location and play sound from the tracker to help locate it. The trackers are waterproof and last about a year before they must be replaced, according to the manufacturer. Volunteers will be on hand to install the trackers in discreet locations, and organizers say it will speed up the process to download the Tile app beforehand from www.thetileapp.com. Tile trackers will be limited to one per person, and each person must bring his or her bicycle and a smartphone. Download the full-size version of this flier here. If you don’t yet have a bicycle to protect, the semiannual Bike Auction — organized by Transportation Services each spring and fall, to clear out its stores of bicycles abandoned on campus, and which have gone unclaimed — will provide plenty of opportunities to pick one up. The bicycles offered for sale vary widely, but at the last auction, the average sale price was $43. The auction will be held at 9 a.m. (with a viewing period starting at 7:30 a.m.) in the Pavilion Parking Structure. More information is available on the UC Davis calendar. If you’re interested in one of these grants, you have until Friday, May 5, to apply. The application is easy. Simply enter your personal information, agree to the terms, and include a cost estimate and explanation what you need and why. For example, you could say you plan to purchase a bike at the UC Davis Bike Auction. Here’s the grant application form. 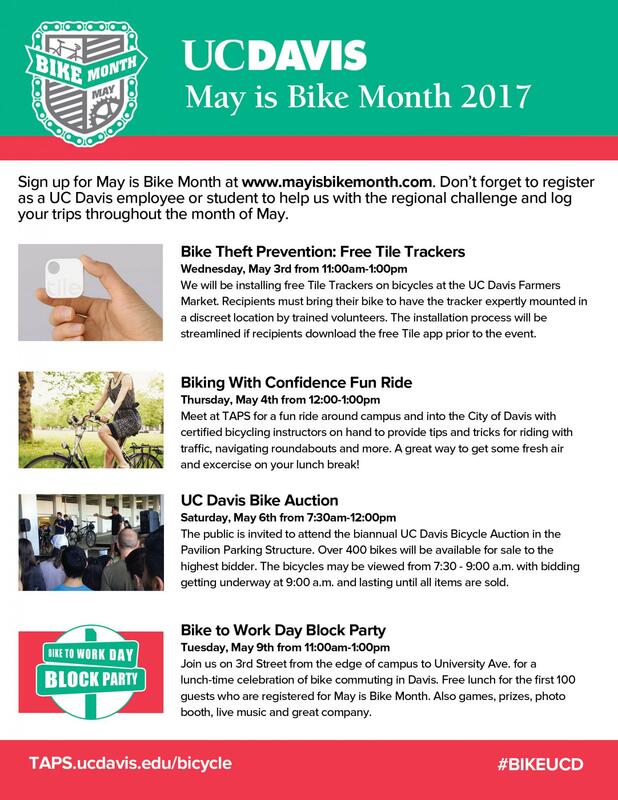 Registering for May is Bike Month will earn points for UC Davis, but it could also get you a free lunch. The first 100 registered participants who stop by the TAPS Bike to Work Day Block Party on Tuesday, May 9, will receive lunch — and everyone will be able to take in games, a photo booth, music from the Cal Aggie Marching Band-uh! and KDVS, giveaways and more. The block party will be held from 11 a.m. to 1 p.m. on Third Street between the east edge of campus (A Street) and University Avenue.